So we have a 1641, big valve heads, mild cam, 40 Weber carb, carb has been rebuilt, new intake boots and seals, new distributor, & wires. Runs rough & backfires at idle, will run smoother if you place you hand mostly over driver side of carb, bit still has minor backfire, also backfires at RPM, #1, and 4 plugs show lean, 3&2 show fine. I'm stumped anyone have any ideas? spray oil on the intake parts until it runs better. that will help to find your leak. maybe you have the wrong jets on one side of the carb? Its the same setup we have used for a couple years now, so jets are not an issue, but I am thinking it may be a fuel flow issue, there never seems to be much fuel in the filter and it doesn't seem to fill up ever. Going to pull the fuel line tonight and crank it over to see how the flow is. 40 IDF? What does it have for a fuel pump? Does it have a regulator? Single IDFs like between 2.5-3psi of fuel, nothing more or less. Any more than that and it will bypass the needle and seat and flood all the time. What size idle jets? Make sure they're clean, they plug easily. I'd also take the filter off and make sure the idle jet vents in the top of the carb are clean as well. When mine backfires/pops it usually means one of the idle jets is dirty. Sometimes takes a few times to clean all the crap out of them. I've changed jets, started the car and put it on the trailer. Got to the destination and unloaded and the car runs like crap. Just how they work sometimes. Yes 40 IDF, Carb has been cleaned 3 times with the same result, rebuilt the carb with a fresh rebuild kit last time I cleaned it same result. fairly new stock fuel pump, brand new in line fuel filter and new filter in carb, fresh gas and tank is clean. Checked all the jets yesterday and they were all clean, blew everything out with compressed air. This is why I'm stumped, and thinking fuel flow. Not sure, Ill look when I get back to work on it, maybe tonight. I didn't build the set up my brother did, it has worked great for several years just has this issue now. Has it always had this same set of heads and cam? Could be a tuning issue now. What are you running for valve springs, single or dual? Cleaned all the jets again last night runs better especially at idle, but still stumbles at RPM, but that could be due to a non charging generator, ( which I just found out about last night) going to swap it out when I get a chance and see what happens. Well it isn't the charging system, looks like I need to pull the carb apart again, at RPM it sound like its running out of fuel popping, sputtering and really loud backfiring, something must be blocked. Cleaned the carb again!, and she's running good, just got to drive the Vert for the first time in 15 years. 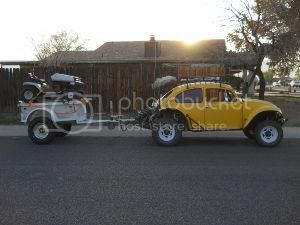 VW Volkswagen & Baja Bug General Discussion Which trans with a 22r Toyota H2O motor?